As you know by now, my name is Monica and this blog is dedicated to all things I want. I’m a proud Latina from San Antonio, Texas who is currently residing in Corpus Christi. I love my husband Daniel and our 13 year old dog Pee Wee more than life itself. I’ve been blogging for 10 years at monicawantsit.com. My design aesthetic is all about black and white plus metallics, florals, chinoiserie, plus pops of colors all with a traditional twist. It’s a tad eclectic, but I am thrilled so many of you love my style and follow along my decor adventures and tutorials. I blog to help others feel empowered to make their homes and spaces more beautiful, no matter what their budget or if they’re in a rental or own their home. Everyone can dwell beautifully is my design manifest. On here I like to share parts of my home to give you design ideas, share what projects I am working on, or my latest finds when I’m out shopping. I love the interaction and inspiration I find here with my followers. I’m a 2006 University of Texas at Austin (Hook ‘Em!) journalism graduate, and I absolutely love the Oxford comma and hate when I can’t use it (darn you, AP style). This blog is what I do in my spare time, and I LOVE IT. I’ve worked with major brands such as The Home Depot, True Value, Better Homes & Gardens, M&M’s, Walmart, and HomeGoods. 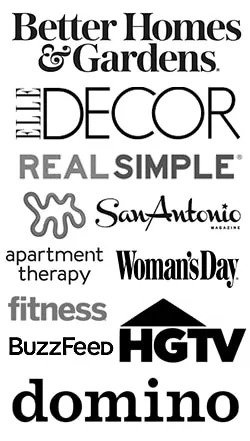 My work has been featured in several popular magazines, websites and television networks such as Fitness, HGTV, Woman’s Day, Better Homes & Gardens, Domino, Real Simple, Apartment Therapy, and Buzzfeed. In 2014, a review I wrote back in 2012 about a fitness DVD went viral and earned me three WHOLE pages in the book Did You Read That Review? : A Compilation of Amazon’s Funniest Reviews, which also features hilarious reviews by George Takei.